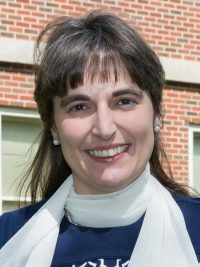 Dr. Claudia K.A. Mewes’s current research is in the area of spintronics, focusing on materials design, optimization, analysis, and modeling for spin-transfer-torque magnetic random-access memories (STT-MRAM) and non-volatile (NV) spin logic. She holds a provisional patent on low-frequency-noise detection. Dr. Mewes has also worked in the field of quantum computing (for her PhD), investigating decoherence-free subspaces and error-correction protocols in many-body systems. Dr. Mewes received her PhD from the University of Kaiserslautern in Germany in 2004. Dr. Mewes was a postdoctoral researcher from 2005-2006 at Ohio State University and at the University of Alabama since 2006. In 2009, she became an adjunct professor of the Department of Physics and Astronomy. In 2010, Dr. Mewes joined the faculty in the UA Department of Physics and Astronomy and the Center for Materials for Information Technology (MINT).